Justiweb Technology | Justifacts Credential Verification Inc.
Picture a world in which the systems and technology you use blend seamlessly into your established work style to support and enhance your current processes. Justifacts’ in-house Software Development Team have built our system based on direct feedback from our clients. Our flexible technology is highly customizable and designed to solve your real-world problems. Justifacts’ in-house software development team has designed a proprietary, web-based background screening report system known as Justiweb. Based on their associated access rights, a client’s authorized users will be provided login credentials to access/view existing and completed background checks in real time using the comprehensive Client Status Screen dashboard. This dashboard includes an array of tools including access to comprehensive administrative reporting and search functions. Because Justiweb is world-accessible, it allows our clients to log-in and utilize our system from anywhere, at any time. Justiweb offers 24-hour online access to your reports in real time. As the status of a background check report is updated, authorized users are able to view any updates as they are made. Justifacts’ web-based system supports most of the popular HTML-based, HTTPS, and Java session-capable web browsers. There are no technical requirements, special interfaces or required software – just a web browser and an internet connection. 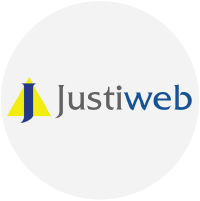 Justiweb is an internet-based application that can allow clients instant online access to their reports at any time they desire. Ensures a secure transfer of all data to and from our system. Our systems must pass intensive audits and penetration tests conducted by third parties including Dell SecureWorks, Experian, and Qualys. Limited electronic access, password protection, truncated social security numbers, clean desk policies, document disposal, and restricted physical access are just a few of the ways we protect applicant’s PII and client information. Simple and efficient is the name of the game when it comes to our technology offerings. You will receive outcome driven HR Tools designed to fit the way you work. Paperless Applicant Portal tool which allows clients to send email requests directly to applicants with a simple click of a button. Justifacts’ Applicant Portal tool includes integrated waivers and smart technology to ensure correct data capture and decrease data entry errors. Seamlessly request and manage background checks and other employment screening services from over 20 popular ATS recruiting interfaces. Don’t see your favorite ATS/HRIS partner listed? Contact our in-house IT department to talk about a custom integration solution.